In a radical statement of his determination to change the look of the Conservative parliamentary party David Cameron will make a speech in Leeds today in which he will set out plans to introduce active discrimination in favour of women candidates. An ‘A’ list of candidates will be compiled for use after next year’s local elections and it appears that it will include at least 50% women. Candidate selection will be frozen until then. ConservativeHome believes that the formation of this ‘A’ list should not be a closed process and we are compiling our own member-driven GoldList. The process is already underway with the nomination of Zac Goldsmith. If you have a nomination please email conservativehome@mac.com. CCHQ’s A-list will be targeted on associations in the most marginal constituencies but these associations will be permitted to choose local candidates in "exceptional" circumstances. Although the list will not be compulsory Party Chairman Francis Maude did say, however, that David Cameron would expect associations to choose from the list. People who are not currently Conservative members will be recruited for the list. Mr Cameron will also use his speech to say that he is open to associations choosing candidates by open primaries or by allowing registered Conservative voters – not just paid-up members – to choose parliamentary candidates. As soon as the speech is delivered it will be posted in full on this site. Featured on this morning’s Today programme and in a number of national newspapers the Panel finds that there is much more support for local candidates than a Gold List "that would include more women, more people from minorities and more people from non-traditional Tory backgrounds". 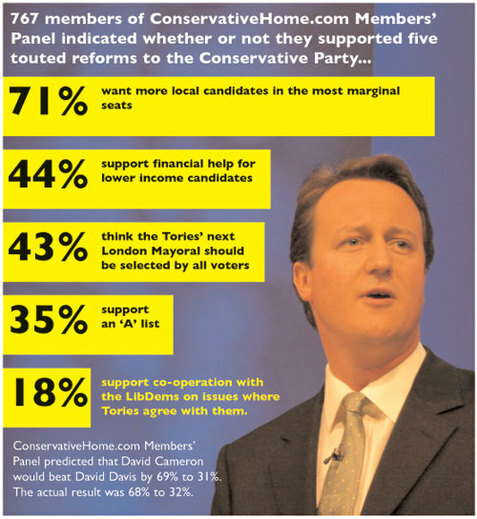 44% of members would also like to see financial help for lower income candidates. This idea has not featured in advance press coverage of Mr Cameron’s speech but may help ensure the party achieves more than a face-deep diversity. A bursary scheme could ensure that more people from the charitable sector and the public services become Tory candidates. Many of these candidates would likely be women and it would be consistent with the party’s deepening commitment to social justice. The ConservativeHome Members’ Panel also suggests that there is very little support for more co-operation with the Liberal Democrats – of the kind modelled by Oliver Letwin. You can join the ConservativeHome.com Members Panel by completing the existing survey – which is still online here.